New Arkham Knight Gameplay Trailer Ignites! 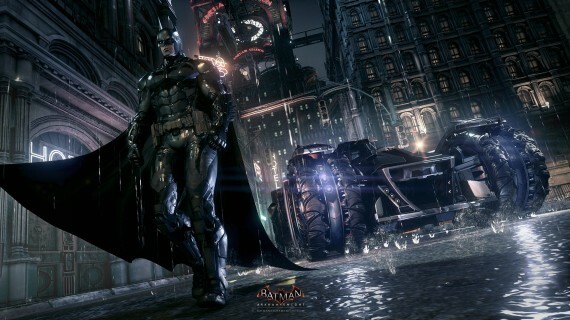 No Comments on New Arkham Knight Gameplay Trailer Ignites! The gloves are off as Rocksteady takes one last knockout punch to the Batman franchise before moving on, and the new gameplay trailers made my inner fanboy scream with glee. The game is scheduled to be released this fall on the PlayStation 4, Xbox One, and PC. This will not be a cross generation game and the visuals show, the visuals are gorgeous. The batmobile makes a huge presence in the trailer, as I stated in my first preview, it will play a major roll in the game, both for combat and traversing the environment. The trailer does hint at the villains that will take center stage; Two-face, the Penguin, Scarecrow, and the mysterious Arkham Knight. Also shown in the trailer is Oracle, a.k.a. Barbara Gordon. She was in the previous two titles but only in voice, and I am glad we are seeing her character even more fleshed out in Knight. I am still trying to figure out who’s behind the Arkham Knight mask. At the ending of Arkham City we had several villains fall, and for the sake of repetition, I hope they stay that way. They did hint at a Talia al Ghul, Bruce Wayne relationship in Arkham City. Could Damian Wayne make an appearance? We also have Hush and Azrael (Michael Lane) that are unaccounted for after City. I hope you enjoy the trailer as much as I did, and it is very nice to have Kevin Conroy back as the Dark Knight.